I was born July 12, 1948, in St. Louis, Missouri, “imprinting” on the Mississippi River. After St. Louis and Little Rock, Arkansas, we moved to Houston, Texas, where I began playing guitar in third grade. My favorite place was the neighborhood ditch, where I took my guitar and Mark Twain books, and imagined the ditch was the Mississippi River. In Junior and Senior High school I played in “garage bands,” church camps, learning a mix of rock’n’roll and folk songs. I also liked Scouting, camping and hiking in East Texas forests and the Texas Hill Country. I wanted to be a Forest Ranger and play music: Smokey Bear and Chuck Berry! We moved to Western Pennsylvania in my last year of High School, where I drove my parents nuts with an electric guitar in the basement. A high point was opening for the Beatles, (well, actually a Beatles’ movie). I wound up in Austin, Texas by the mid-70s, with adventures in Arizona, Maryland, and Ohio. By the early 80s, I had many Community College hours, inspired by the biology deptartment and local enthusiasts to write “Habitat” and other songs for the growing environmental movement. The multi-talented Glen Waldeck and I teamed up and began performing for events, schools, honky tonks and festivals. We played together for years as the “Environmental Troubadours,” dubbed by TIME Magazine, November, 1989. Between us we produced seven albums, several videos, and countless campfires. Our music took us around the US and beyond, with highlights in Alaska, Hawaii, & Japan. 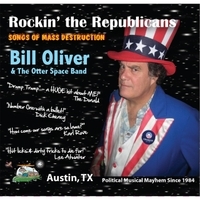 For the last ten years I’ve been busy with solo shows and the all star Otter Space Band. Our album “Friend of the River,” relates to my love of the Texas River School in Austin, and river events elsewhere. I’m still a “travelin’ troubadour,” but sticking closer to home. I’m honored to be listed in the Texas Commission on the Arts “Touring Roster.” In Austin I produce two festivals for youngsters and families: “Mother Earth Day at the Springs” a concert and eco-fair in May at Barton Springs, and “Lady Bird Lake Fest,” both sponsored by the City of Austin and others. Future Otter Space projects include river trips, recordings, and fun-filled musical adventures. Stay tuned! “The first Otter.” One day in the mid-’80′s Doug approached me at an Austin gig, and suggested he join. He was right! A self-employed lighting engineer by day, he’s had thirty years of music with Austin groups CPR, and Ain’t Misbehavin’. The “go-to” guy in many respects, his electric mandolin style makes our sound unique. He has a talented family, with Nathan and Sophie growing up as “support” Otters! “Pablo” is one of the most sought after percussionists in Austin, for sessions and gigs. Honored several times as “Best Drummer” in Austin Chronicle Music Polls, he’s also a top notch studio producer. I know him as a boating dude, as well, former board member for the Texas River School, and good friend. She is “classically trained” and plays it, but also in the classical genres of Austin folk circles: plays rock-a-billy with Jon Emery’s big bands, jazz with Slim Richie’s Jazz Pharaohs, and folk with everyone! Also a great session player, road musician, and river rat! “Cowboy Bob,” the original “Lost Gonzo” of the early cosmic cowboy era! Side-kick to this day for Jerry Jeff Walker, he’s come out on his own with his fabulous “Cowboys and Indians” album and project: applying thirty years of experience in India and the American West thru musical ambassadorship. We’re lucky to get him when we can.